SUN CITY, South Africa (AP) At times over the last 4 1/2 years Lee Westwood wondered if he'd ever win another tournament on the European Tour. Westwood was finally back in the winner's circle on Sunday and it was in a familiar setting, clinching his third title at the Nedbank Golf Challenge in South Africa by coming from behind to overhaul a three-shot deficit in the final round. Westwood denied Sergio Garcia a wire-to-wire victory at Sun City and Louis Oosthuizen a first success at his home tournament by surging past the two major winners with a fabulous 8-under-par 64. Westwood won back-to-back Nedbank titles in 2010-11, before the event was part of the tour, but hadn't tasted victory on the European Tour since April 2014. The 45-year-old Englishman hadn't won anywhere for more than three years. "I'm a bit emotional, to be honest," Westwood said, his voice breaking as he battled to hold back tears. "You're never sure whether you're going to be able to do it again. Until now my emotions have felt really under control all day, which is what I've been working hard on." Westwood saved his best - as well as his tears - for last at Gary Player Country Club as the best round of the day and only the second 64 of the week saw him finish on 15 under overall, a three-shot win over Garcia (70), with Oosthuizen (69) third on 11 under. He made an eagle on No. 2 and six birdies in all, five of them on the back nine, as he charged to his 24th European title and 43rd career victory in the penultimate event of the season. His birdies on Nos. 16 and 17, set up by pin-point iron play as the pressure mounted, settled a fascinating final-round battle between him, Garcia and Oosthuizen. "I was just trying to hit fairways and stick to my game-plan and hit it in the right places, Westwood said. "I've got a bit of a process that I'm going through with my golf swing and I'm starting to see better shots. The 7-iron into 17 is probably one of the best shots I've ever hit." Garcia had led from the start and had a two-shot advantage over Oosthuizen and was three ahead of Westwood after three rounds. But Westwood's finish proved irresistible. Down the stretch, Garcia couldn't make any birdies on the last six holes. 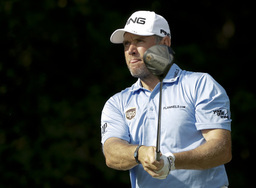 Oosthuizen kept slipping up, with three bogeys and a double-bogey on the last to go with his eight birdies. Westwood didn't drop a shot all day. The Nedbank Challenge also had repercussions for the Race to Dubai, with Rory McIlroy, Li Haotong and Lucas Bjerregaard now all officially out of the running to be crowned European No. 1 next weekend at the season-ending DP World Tour Championship. That will now be a shootout between Race to Dubai standings leader Francesco Molinari and his Ryder Cup buddy Tommy Fleetwood after McIlroy finished in a tie for 21st in Sun City with a final-round 71, Li finished tied for fifth with a 65, and Bjerregaard tied for 11th after also closing with a 65. McIlroy needed to finish in the top two to stay in contention for the season title while Li and Bjerregaard both needed to win in Sun City.